Spend another £70.00 to get FREE DELIVERY! Bathroom and toilet fan with adjustable electronic overrun timer and indication light which operates on the override only. 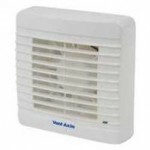 The VA100 range from Vent-Axia is designed for domestic bathrooms and toilets. Available as window, wall or panel mounted models. A range of fans with options of shutter, timer or humidity controlled versions.